At a modern house in Westport, a throwback to the mid-20th century, the lawn has been shaped into wavelike terraces. WESTPORT — I thought it would be fun, with summer approaching, to do a piece on a simple vacation house. The idea is to remind us that good architecture comes in small family packages, not only in prominent buildings by big-name designers. The house I’ve picked also makes the point that in architecture, no style ever really dies. Styles get put on the shelf for a while, but they are eventually revived by the architects of a later era. In the case of this house, the style in question is modernism. Modernism has been around for nearly a century, so I think it’s fair by now to consider it just another historic way of building. On the entry side, a window into the kitchen. The house is sited on a wide tidal bay of the Westport River, near the point where Massachusetts and Rhode Island meet the Atlantic. I guess if you had to find a label, it would be Retro Modern. It’s a deliberate throwback to the era — say the 1940s through the ’60s — when crisp, simple, flat-roofed houses were all the rage in the world of architecture. Such houses are now unfashionable in some quarters, and a lot of them are being torn down. The Westport house reminds us of how wonderful this kind of architecture can be. The owners are Susan Schlesinger and her husband, Rick Guidelli, who live in Cambridge. The architect is Will Ruhl of Ruhl Walker Architects in Boston. What’s striking about the house is the skill with which it’s fitted to its place in the world, to the land and the view. You don’t look at the house so much as you look through it, to the ever-changing scene of water, sky, and trees. In this work of art, the house is the frame, not the picture. Like a lot of early modernist architecture, the Westport house is rich in nautical metaphors. Modernist architects loved the taut, stripped-down quality of the architecture of boats and docks. Using that imagery here, Ruhl fashions a deft choreography of approach and entry. You start by parking your car at the back of the lot, at the farthest point from the river, which you can’t see. You cross a lawn and walk straight up a wood ramp to the house’s main level. The ramp feels like a dock from which your ship is about to depart. When you enter the house, the full river view explodes in front of you through walls of glass, with some of the suddenness of a wide-screen movie. Standing there looking out, you are elevated just enough so that you don’t really notice the front lawn, which slopes below you down to the river. You see, instead, only sky and water, as if you were afloat in your very own yacht. 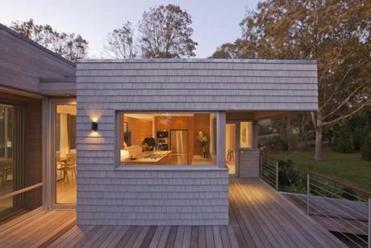 “The house is like a boat up on piers,” says Ruhl. You do see that lawn when you walk on down to the water and turn to look back at the house. Here there’s another nautical move, this one by the landscape architect, Doug Reed of the firm Reed Hilderbrand Associates. Reed shapes the lawn into green terraces that resemble rolling waves, over which the house seems to be riding. The interiors are equally delightful and equally unpretentious. I’m being retro again, but the interior has the look of a showroom in Harvard Square’s famed Design Research store of the 1960s, a mix of white walls, bright color accents, simple Scandinavian-inspired furnishings, and a few found objects such as a hundred-year-old spruce dining table. Designer Diane Cramphin of the firm Oblio collaborated with the owners on interiors. Schlesinger and Guidelli say they love to cook and entertain friends. There’s plenty of room in the house for a crowd, but it doesn’t feel empty without one. The living area is broken into three spaces. One is a roofless deck. Another is a roofed porch, with sliding glass walls that open up in good weather. And a third is a conventional living-dining room with a fireplace. They all open into one another: three spaces, three ways of experiencing the view and the weather. He says the house, which stands on the concrete foundation of a saltbox that previously occupied the site, would have cost about $1.7 million if he hadn’t built it himself. Houses near saltwater tend to turn gray. Here that process is speeded by bleaching the ash wood floors, the walnut fireplace wall, and the exterior shingles and siding, which are Spanish cedar. Finished only a few months ago, the house is already beginning to look as if it’s weathered in. I love the Westport house. That’s not to say, though, that I don’t also love the gnarled Victorians that dot the coast of New England, with their ditsy porches and towers, their sloping roofs and rough stone fireplaces. Good architects today are reviving those styles, too. Modernism certainly isn’t the only way to go. There’s never only one true way to do architecture. The rule is simple: Whatever you do, do it well. The Westport house is done superbly. Robert Campbell, the Globe’s architecture critic, can be reached at camglobe@ aol.com.